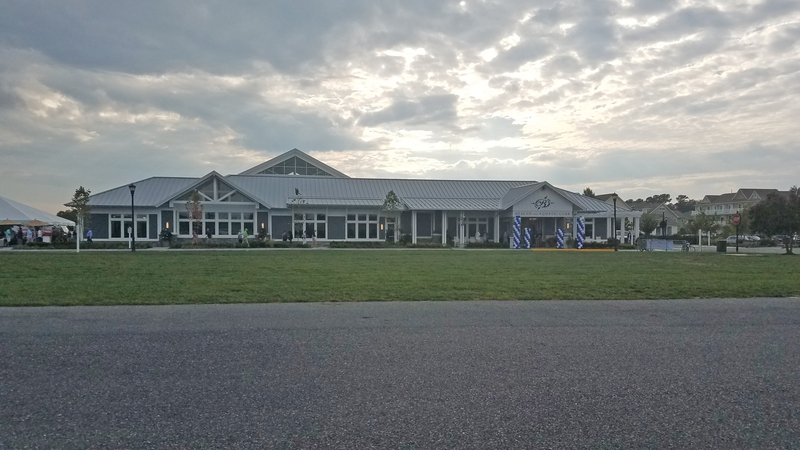 George, Miles & Buhr designed the Cecil County Landfill Septage Acceptance Station to facilitate the need of removing concentrated septage waste loading at the Seneca Point Wastewater Treatment facility. Prior to the design and construction of this new facility septic tank haulers delivered concentrated sewage material to the Seneca Point plant. This waste material was put directly into the wastewater stream, thus putting a strain on plant treatment capabilities. 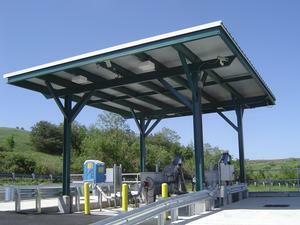 The Septage Acceptance Station consists of a canopied screening facility; spill containment and truck wash down area, aerated holding tank, and vent filter bed. Septage haulers connect directly to the screening units to discharge the contents of their trucks. Septage deliveries are measured and tracked using flow meters and state of the art CCTV / DVR electronic surveillance systems. The facility currently services approximately 12 trucks per day with an ultimate design capacity of 25 trucks per day. Each septage screening unit conveys the waste material through the machine using an Archimedes Screw device. Organic and inorganic materials are separated as the waste stream moves through each unit. The cleaned inorganic material is discharged out of each unit as a dried cake material, collected and then disposed of in the landfill facility. Organic material drains from each septage unit throughout the screening process and is collected in the septage holding tank. Organic septage material is treated via aeration and is held in the septage holding tank until discharged into the adjacent sanitary sewer. Aeration of the screened septage material prevents the onset of anaerobic conditions and thus reduces odors. The enclosed holding tank is equipped with aluminum hatches for maintenance access and a ventilation system. The ventilation system discharges into a vent filter bed which provides additional odor control. The vent filter bed consists of a perforated PVC pipe header, washed gravel, filter fabric, polyethylene enclosure lining, and hardwood and pine bark nuggets. The filter bed structure was designed to mimic a landscape box. Expansion of the on-site treatment capabilities of the Septage Acceptance Station will consist of the design and construction of a reed bed facility. Reed bed filtration will mimic sludge treatment systems used at the Seneca Point Wastewater Treatment Plant. Submersible pumps will be installed in the septage holding tank to transfer the screened septage to the reed beds. The reed beds will consist of an impermeable geomembrane liner which will collect the treated septage water in an underdrain system. The treated septage water will be directed to the sanitary sewer system for conveyance to the waste water treatment facility for final disposal.